Jaguar EPC for Mac? I'm British Racing Green with envy. I installed it today and it went great but if I click the VIN ID I get a box saying it can’t connect to the internet. The internet connection is ok. Is anyone else getting this problem? Does anyone have a solution? The only the local menu items work (not anything that needs to connect to the internet because those internet features require repair shops subscription). Click on Model Range will display the model selection page. Click on the down arrow before the Vin ID button will display a drop down model selection list on the right side of the screen. 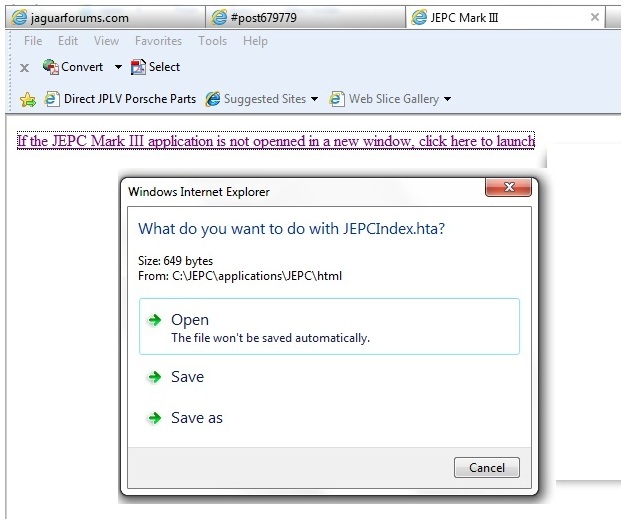 "If the JEPC Mark III application is not openned in a new window, click here to launch"
Click on it and VOILA! The catalog LOGIN page will be displayed!" I verified it got me to the login page this morning. Last edited by jimlombardi; 04-24-2014 at 01:35 PM. I'm on a Win 7 64 bit machine and the ADMIN 123 login fails - I gues that it's the OS? I can transfer it all to a legacy 32 bit XP machine if neccessary, but it would be easier to have it on my current workstation. 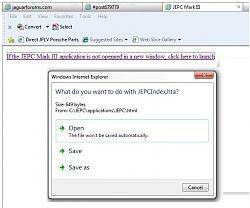 I have the JEPC installed on my win7 64 bit PC and it is working without any problems. Look at previous post (post# 25) - try the login steps in the post. Sorry Jim. I tried clicking on index.html, and I got a window saying "You have chosen to open JEPCIndex.hta which is a: HTML application (649 bytes) from C:\JEPC\applications\JEPC\html Would you like to save this file?" There are only two options in the window, a Save button, and a Cancel button. Clicking on Save pulls up a window pointing at my Downloads directory, so I can't see that this is much use. I looked at the html in index.html, and it points to JEPCIndex.hta. I found that file in the html sub-diretory, and double clicked on it. The login page does appear, but entering Admin and 123 does nothing at all. It brought up the Log in screen, but did nothing after I put in admin userid and 123 password. Next I used the the JPEC icon (shortcut) - it brought up Log in screen and it processed the admin userid and 123 password correctly - then brought up the JEPC model selection screen. I copied my JPEC shortcut file to my dropbox.com account. Try downloading it and see if it works on your PC. I am not sure why running the JEPC from the shortcut works and does not work when I tried running it directly from C:\JEPC\applications\JEPC\html\JEPCIndex.hta. It might have something to do with some kind of file path processing???? If the shortcut does not resolve the issue, then maybe you need to do the downloads and installation again. The index.html should bring up the popup menu with 3 choices - Open, Save, or Save as. I updated post# 25 with a JPEG showing the popup menu. Last edited by jimlombardi; 04-24-2014 at 01:34 PM. Won't load in Wine under Linux so I have some fiddling to do to see if I can get it to work. Thanks for providing the files/info! Thanks very much, I've now sorted out the installation issues I had, it was the idiot on the keyboard that caused the problems. A very useful asset. can't someone throw it up on dropbox? Nothing in the links worked, so I erased everything and started again, making sure to follow the instructions to the letter, and it worked this time. Dunno what it was? Thanks for your help Jim. Hi all. First problem is after I unzip and attempt to cut and paste to C drive. One file transfers but the bigger one gives me a message that says the file is in use by another program. So then I tried copying, which worked but takes 20 minutes and I'm not sure the result is correct. Has anyone encountered this and solved for? Second, after the copy, launch, sign in. Every part I select randomly, no pics appear. When I select anything within the catalog I get the message no internet connection. Keep in mind this is after I'm in the catalog. Has anyone encountered this problem. In case it matters, Window 7 OS 64 bit. Deleted this post. I will create new post that covers downloading 2 new archive files for JEPC (JEPC.exe that will create C:\JEPC folder and jepcv5.exe will create C\jepcv5 folder). Last edited by jimlombardi; 04-24-2014 at 01:33 PM. Thanks Jim, I'm still encountering the same issue. I've tried connecting via the shortcut and also via the index under JEPC Apps. I get this when I try to locate a part or when I try to add my VIN. I installed it on my Mac using the newest OS and Wine, but can't get it to load. I see all the files, etc. just can't get it to run. I have the same problem with another program (not Jaguar related) that I need to run on my Mac. If you figure anything out, please let me know. I'm about ready to install Windows on my Mac, something I've considered for a while now but have always found a way to avoid it!